Conor McGregor is considered the Ultimate Fighting Championship’s (UFC) biggest PPV draw. He has gained millions of fans across the globe with his bravado both outside and inside combat sports arenas. Who is Conor McGregor, how old is he, when is his birthday, how tall is he and what is his background? Conor McGregor was born in Crumlin, Dublin, Ireland on July 14 1988. He is 30 years old and is 1.75 metres tall. The star’s passion for boxing began at the age of 12 when he began training at the Crumlin Boxing Club. In 2006, aged 17, McGregor and his family relocated to Lucan, Dublin, where he focused on his career and started a plumbing apprenticeship. While in Lucan, McGregor met fellow Irish MMA hopeful, Tom Egan, and discovered the sport. He would train with Egan until his amateur debut on Saturday 17 February 2007. What is Conor McGregor famous for and what is his occupation? McGregor is a mixed martial artist, boxer, promoter and entrepreneur. The Irishman is famous for his post-fight antics, willingness to take on all comers, and utter belief that he can achieve anything he puts his mind to. His most notable venture to date was his boxing match with Floyd Mayweather Jr. A lead up tour followed by the blockbuster event has forever cemented his fame with both MMA, boxing and popular culture circles. As reported by Forbes, McGregor’s earnings from UFC purses in 2017 totalled £21million, as well as £5.5million in endorsement and sponsorship deals. 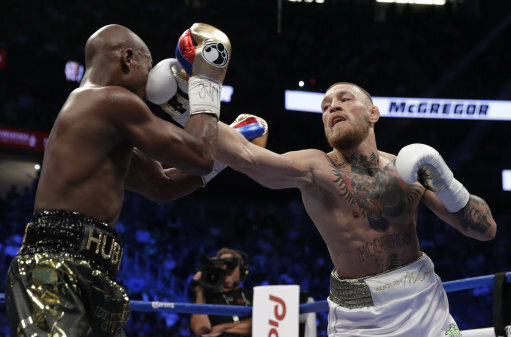 McGregor pocketed a minimum of £22.5million for his fight with Mayweather Jr, which brought his his net worth to £49million. Profits from the Mayweather Jr fight have been estimated at as much as £56million, but have not been fully reported. Where is Conor McGregor from? McGregor hails from Dublin, Ireland. McGregor currently fights at 155 pounds or 70.31kg. 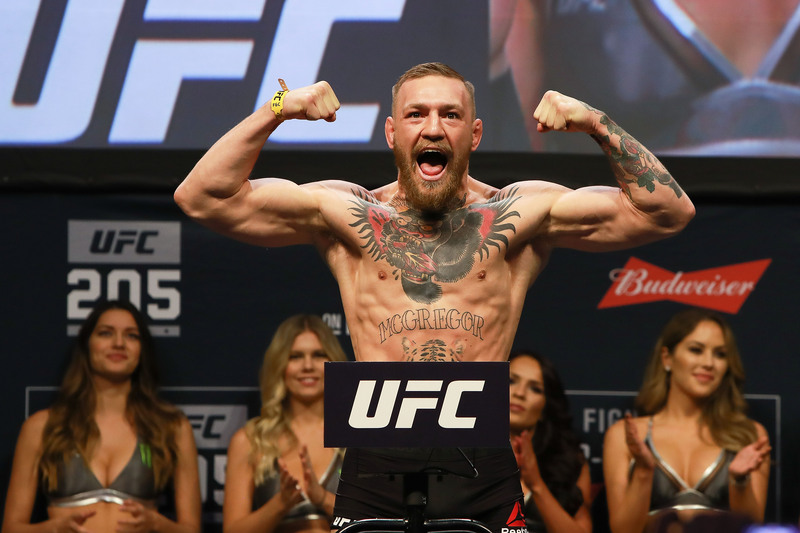 According to his coach, John Kavanagh, and McGregor himself, his weight when not fighting is approximately 170 pounds or 77.11kg. Where does Conor McGregor live? McGregor splits his time between Dublin, Ireland and Las Vegas, Nevada. What and when were Conor McGregor’s most famous fights, and how much did he make from each of them? Following his fight with Floyd Mayweather Jr. on Saturday 26 August 2017, he earned a reported £21million. His second fight against Nate Diaz on Saturday 20 August 2016, earned him £2.3million, and during his first fight with Nate Diaz on Saturday 5 March 2016, he earned £819,699. When did Conor McGregor fight Floyd Mayweather, who are Conor McGregor’s other famous rivals? McGregor fought Floyd Mayweather Jr, hailed as ‘The Money Fight’, in Paradise, Las Vegas at the T-Mobile Arena on Saturday 26 August 2017. Other notable rivals of McGregor include Jose Aldo, Nate Diaz and Eddie Alvarez. How much does Conor McGregor earn? McGregor earns approximately £2.6million per UFC fight, under the terms of his current contract. Is Conor McGregor in a relationship, who has he dated? McGregor is in a relationship with Dee Devlin. The two have been together since 2008 and on 5 May 2017, welcomed their first child, Conor Jack McGregor Jr.
What belts and awards does Conor McGregor have? He currently holds the UFC Lightweight belt and has held the UFC Featherweight belt. The ‘Notorious’ is the first fighter in UFC history to hold titles in two divisions simultaneously. McGregor has been named fighter of the year by numerous mixed martial arts publication: Bleacher Report (2015), ESPN (2015) and Sherdog (2015-17). He also claimed the award for International Fighter of the Year in 2014 and 2015 at the World MMA Awards, while also being named the Awards’ 2015 Fighter of the Year. He was named one of Time Magazine’s 2017 Top 100 Most Influential People. Who is Conor McGregor’s coach? McGregor trains at SBG (Straight Blast Gym) in Dublin, Ireland. His head coach is John Kavanagh, who is the first native of Ireland to receive a Brazilian jiu-jitsu black belt. How did Conor McGregor get discovered, how long has he been boxing for? McGregor began his combat sports journey at the Crumlin Boxing Club in 2000 at the age of 12. He continued with boxing until his focus shifted to MMA at the age of 16. UFC president Dana White travelled to Dublin, Ireland in February 2013 to receive an honorary award. At the time McGregor had recently captured the CWFC Featherweight and Lightweight titles. While in Dublin, White was met with massive fanfare to sign McGregor to the UFC. White met with McGregor and upon discussing the situation with UFC executives signed McGregor to the UFC days later.